Kitchen apron - 50 best photos! 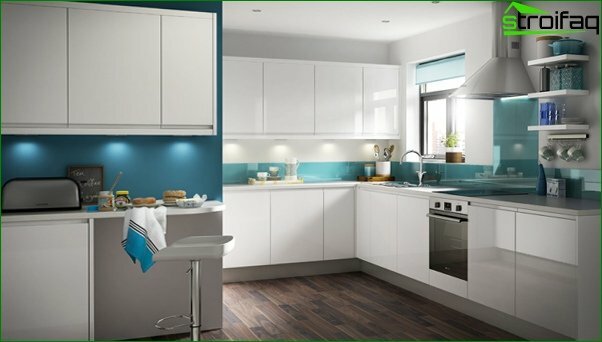 What to consider when choosing? What material will approach better? Design Options. 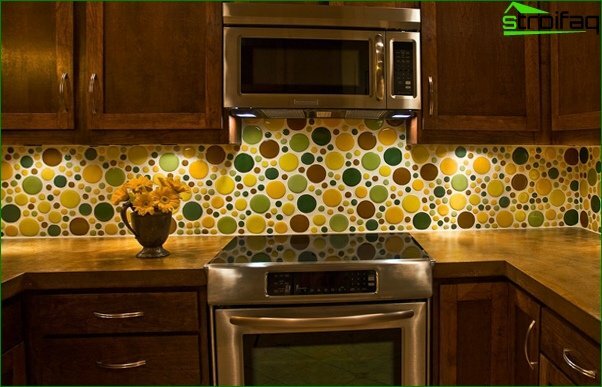 Tile is the most popular option forkitchen design. Although the functionality of this variant, it can be quite expensive to do in cost. 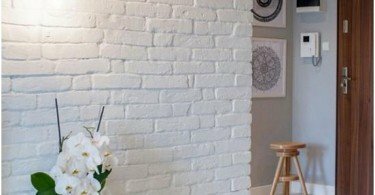 Nevertheless, to decorate the walls in the working area, it is desirable to use a durable and easy-to-clean materials, to get the so-called "apron". Photo aprons interesting interior kitchen attached. When cutting vegetables, fruits, meat, spray flying in all directions. Allocated during cooking fat and soot that are deposited on the walls and other surfaces. During washing dishes on a wall damaged by water, detergents, residues of oils and fats used for frying. To all of the above does not spoil the look of your foodAs times and needs an apron. In principle, it is possible to make the entire perimeter dishes. 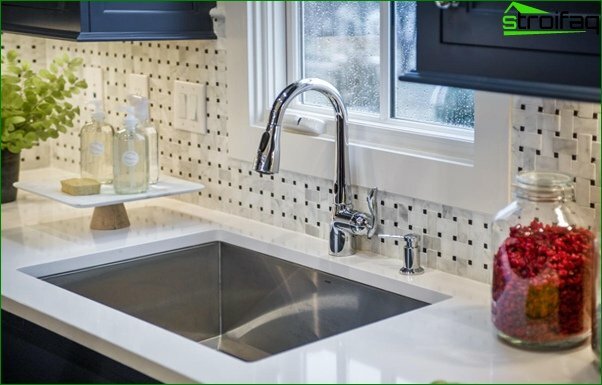 But if your budget is allocated for the repair of the kitchen, it is very limited, it is desirable to protect the apron at least those parts of the wall. 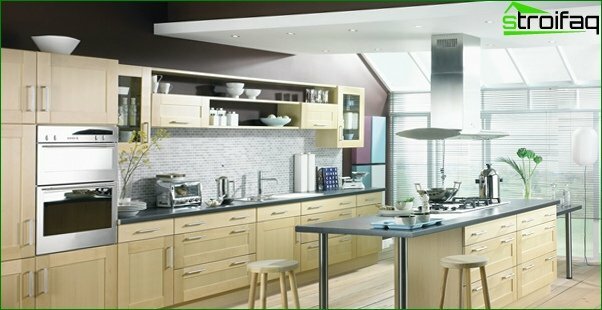 The apron should slightly exceed the limits of the table,plate or pedestal sink, so the walls were maximally protected. If something of this stands in the corner, it is desirable to and adjacent to the main wall of the walls of the apron was posted (even a little). On average, it should protrude approximately 15-20 centimeters. 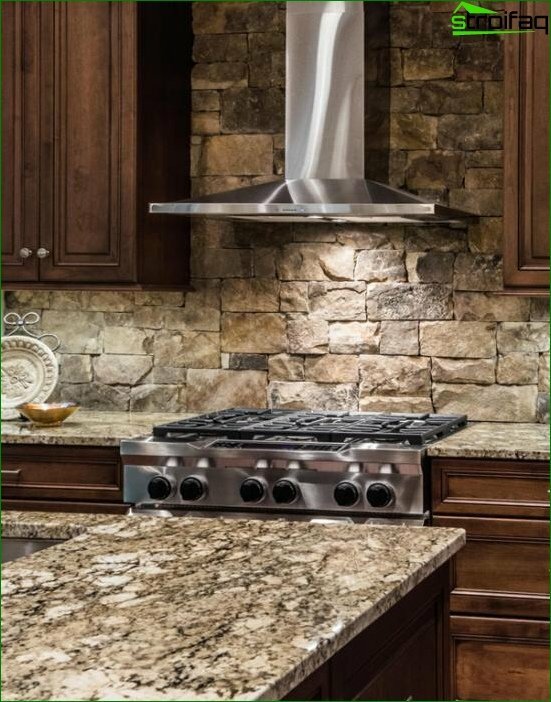 you must pay attention to the height andapron. 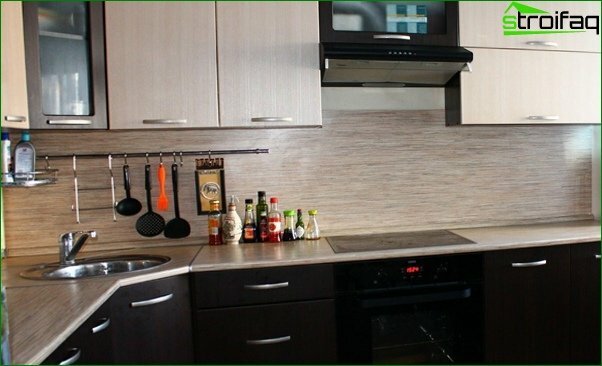 If the above work surfaces are placed hanging lockers or the hood, the apron must completely cover the full distance plus 5 centimeters of furniture items (otherwise, the joints between the furniture, apron and wallpaper will reserve dirt, disease-causing bacteria, and even cockroaches and ants!). The joint between the wall and a desk and a sinkexperts recommend to plug the sloping plinth and connection points be sealed (in an ideal - silicone). This prevents ingress of food pieces to the floor of the working area as well, and more importantly, the water, because of which the furniture may start to rot. If there is nothing above the work surface, the height of the apron must be determined independently. It can be up to the ceiling, but not less than sixty centimeters. 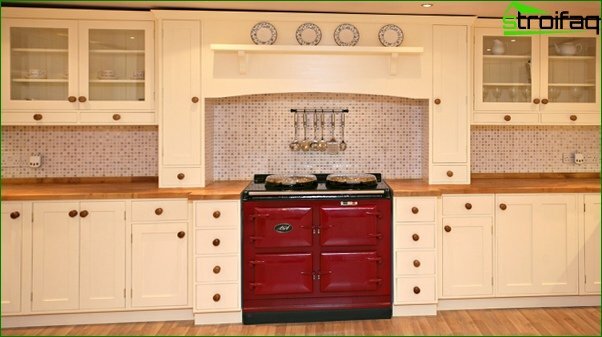 If you have a gas stove, the height of the apron over it should be between 75 centimeters! Porous materials for the apron should be avoided, since the existing pores will place additional accumulation of dirt! Now on each of such materials. 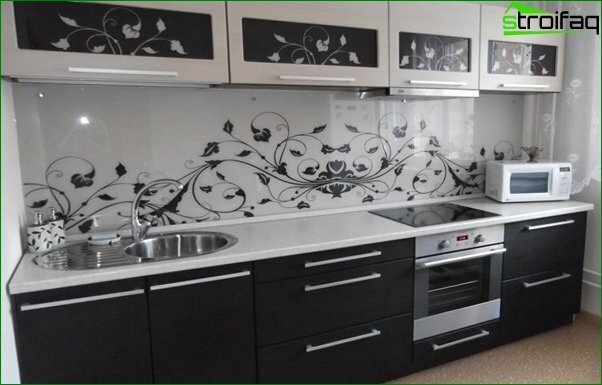 Tile Kitchen - Ideal for a combination of price and quality. 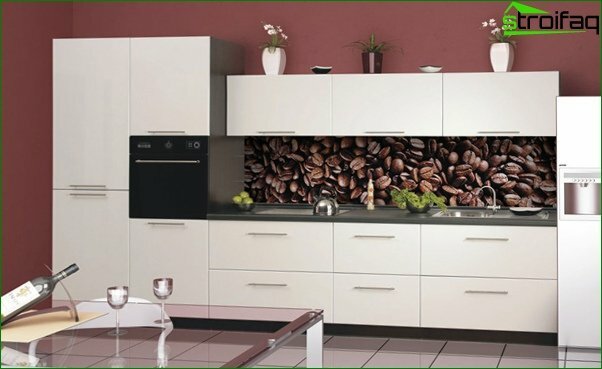 With a wide range of tiles from different manufacturers, even with the limited budget, you can choose the tiles. 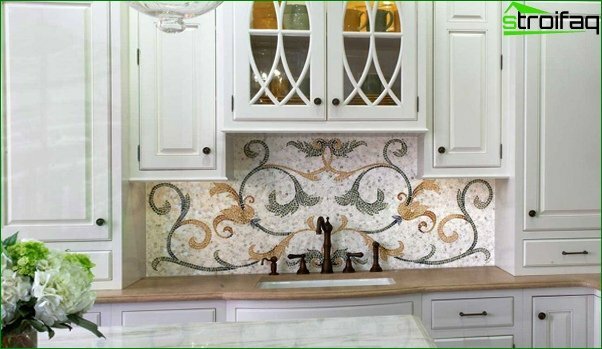 A wide choice of patterns, textures and colors give the opportunity to create unique, original, special apron of tile. apron sizes can be adjusted in the process, making it higher or lower vykladyvanii tiles. 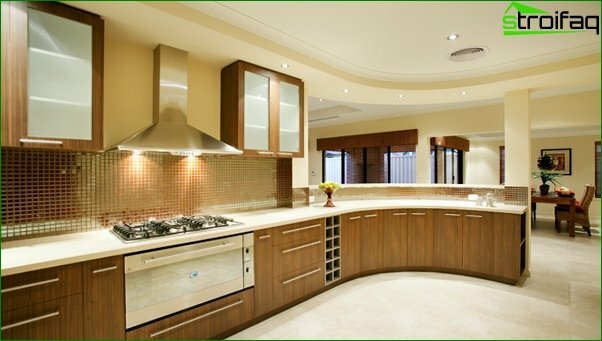 The undoubted advantage of the apron of tile is its durability, an average of about 20-25 years. However, if you get tired of it - change it will not be so easy. 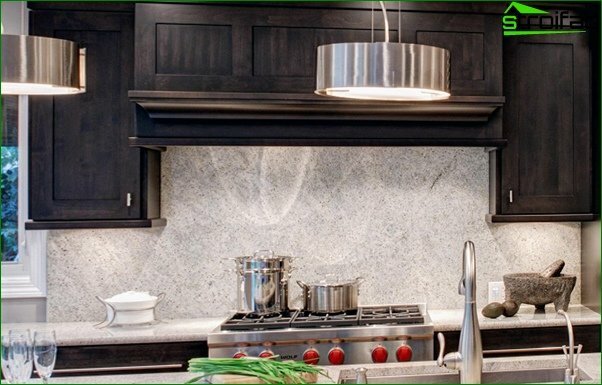 Tiles for the kitchen is easy to clean, which greatly simplifies the maintenance of the apron. 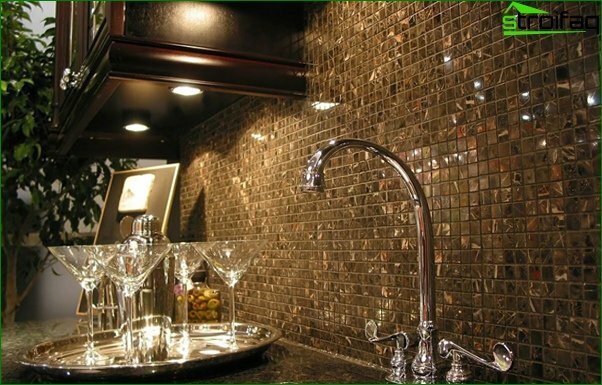 Glazed tile from the tile does not absorb moisture. In addition to standard drawing, you can select a tile with spectacular photos, or even make it to order. 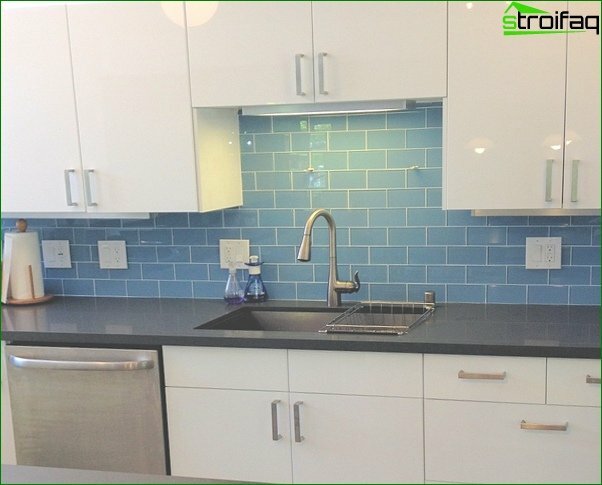 Factory tiles for the kitchen apron with a photo is stronger and better than custom made. 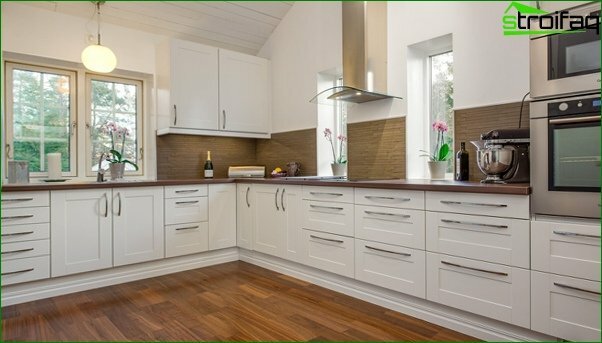 Many joints between the tiles, if not properly treated, can become the home of dirt and grime. For the apron must be glazed tile, porous texture will not fit. Without experience, you are beautifully tiledunlikely to be able to own. 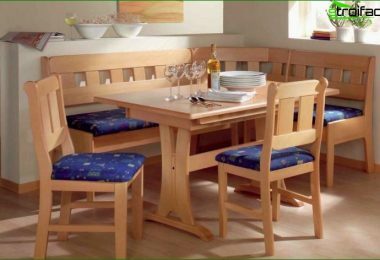 In addition, this process requires a number of special tools that you later can not be useful (all of them can be purchased at the online store catalog Leroy Merlin). 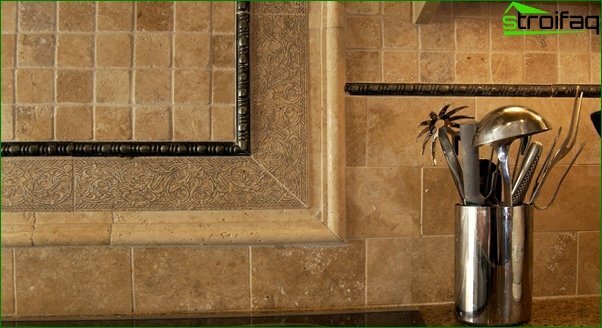 Laying tile requires careful preparation of the walls, in particular - the alignment. 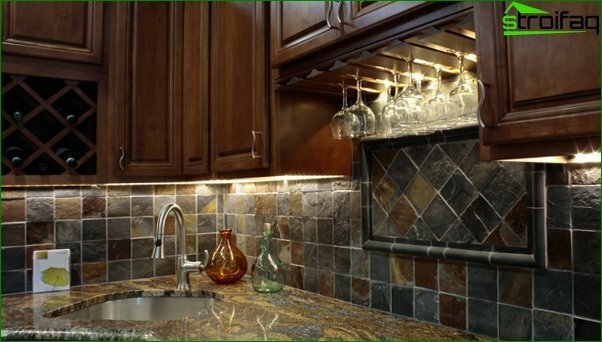 Glass apron is just as easy to clean as ceramic tiles. There are no joints and pores in which to accumulate dirt. 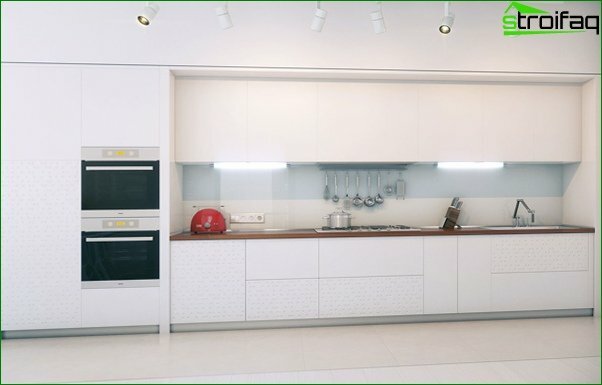 Apron made of glass can be easily mounted even after the installation of kitchen units, so no need to wait for the next repair. Installation is not dusty, almost no dirt. There is no need to align the wall, as the apron is fixed not on the glue. If the glass of the lamp post apron, get the original auxiliary light source, which is stunningly easy to cook food. Lime stains from splashing on the glass more visible than on the tiles. 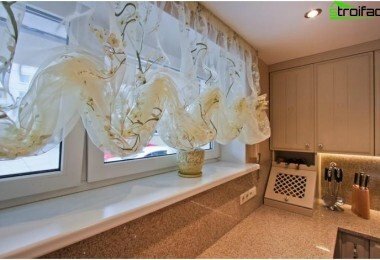 Install glass apron should only well-versed in the people, otherwise - there is a risk to break the glass. Apron made of natural stone is perfectlycombined with a top made of the same material. However, it is the most expensive option of registration kitchen apron. 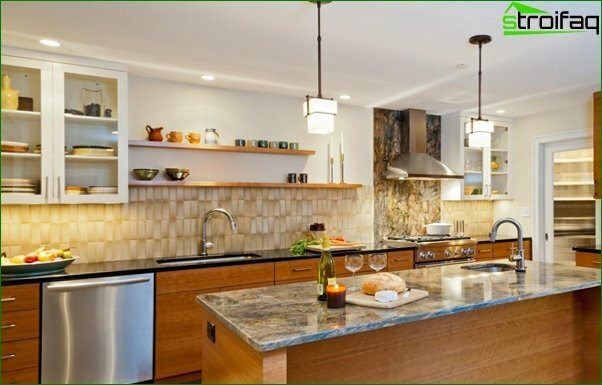 Stone apron is most often used for the decoration of the kitchen in the loft-style, high-tech country, at least - a classic. 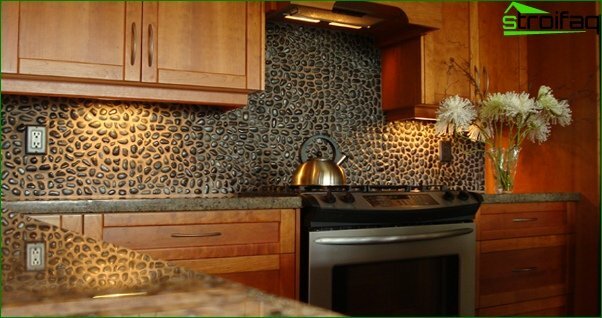 Natural stone - a very porous material, so its functionality is somewhat worse than that of tile or glass. 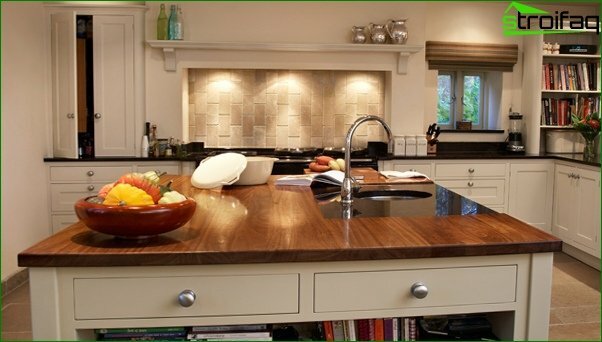 Wood - ideal for kitchen design inclassic style. 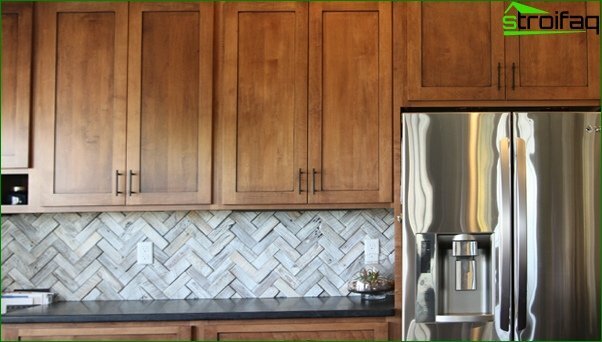 Wall panels of wood for the kitchen does not necessarily have to be identical to wood kitchen units, they can be quite contrasting. To a wooden apron served you long,the tree should be carefully handled vlagoottalkivayuschey compositions. 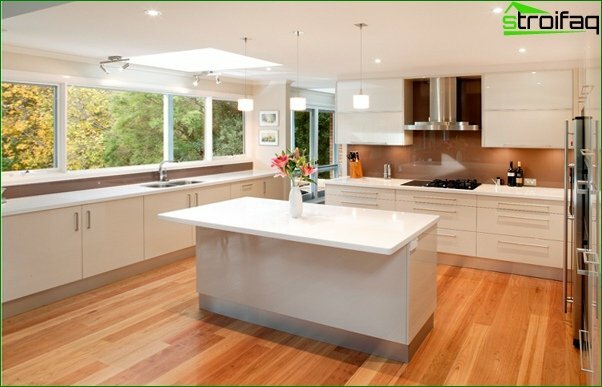 Otherwise, the wood under the influence of moisture (especially near the sink) swells and begins to rot. 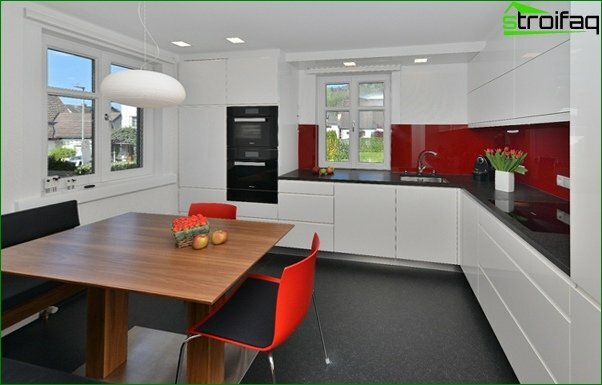 The plastic wall panels to dateThey are the cheapest option for the decoration of the apron. 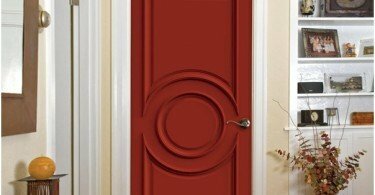 They are easy to install by hand, and as the pliability of plastic material allows to give them any shape and color. 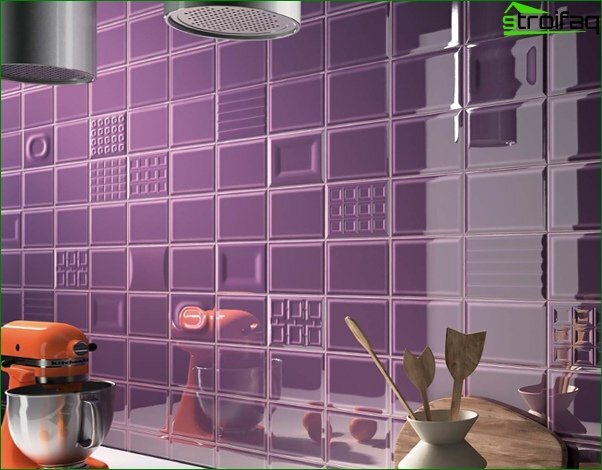 Panels made of plastic not afraid of water, they are quite simple and easy to clean, but in the area of ​​cooking their area better, after all, is not used as the plastic under high temperature changes its color and may begin to melt (while stressing the harmful pair). 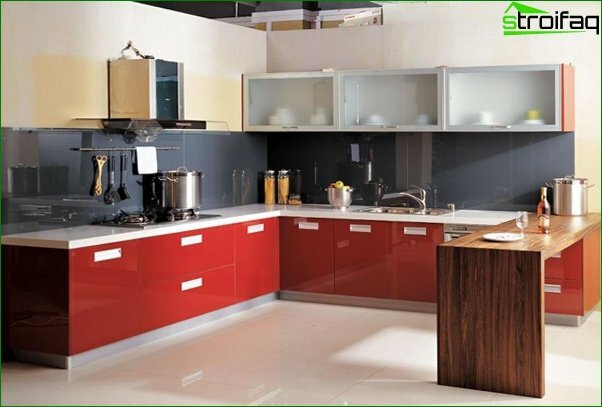 Kitchen apron can be a perfect backdropto emphasize the beauty and elegance, wealth, style and other objects of the kitchen interior (eg kitchen units), and become an independent central element of the room decor. 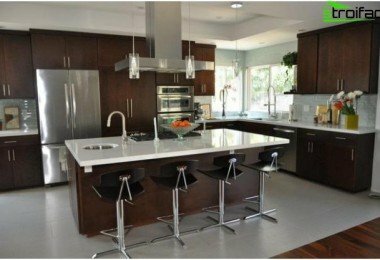 If dedicated to kitchen remodeling budget is verylimited, it may make sense to buy inexpensive furniture and wallpaper for the walls, but to allocate a slightly larger amount to the apron. 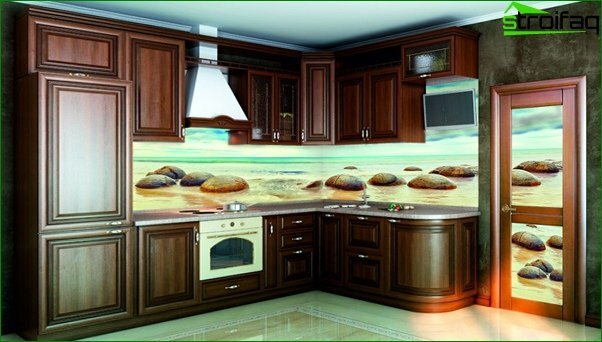 That he will be the main decoration of your kitchen and will engage the views of the guests. Apron in tune with the overall color does not mean thatAll food is made exclusively in one color. 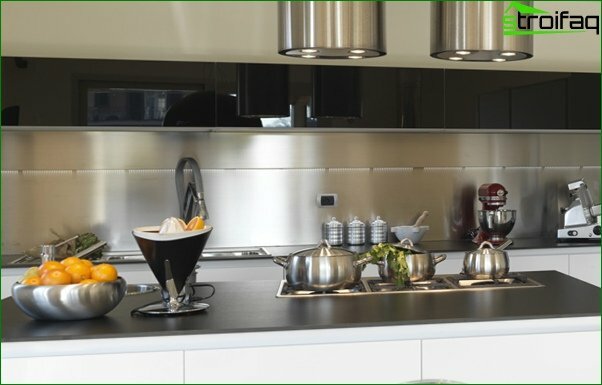 Apron can be in harmony with the worktop or (as is most often the case), or appliances, or furniture, or to the main decoration of the walls. The main thing that the apron is like a visual continuation of something in the kitchen. This apron is unlikely to decorate the kitchen, he would rather perform exceptionally protective function. Contrast apron can be both profitable emphasizes other kitchen objects of interior element, and it independent adornment, focuses on all the attention. Contrasts kitchen apron can beneutral shades. 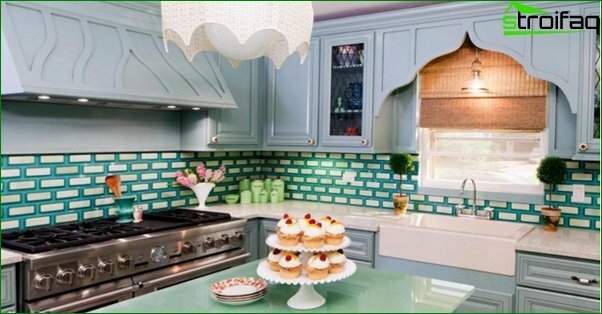 The most popular are white and various shades (ivory, butter, with a blue tint), as they are combined with virtually all shades of the palette. beige and gray colors are also in demand. 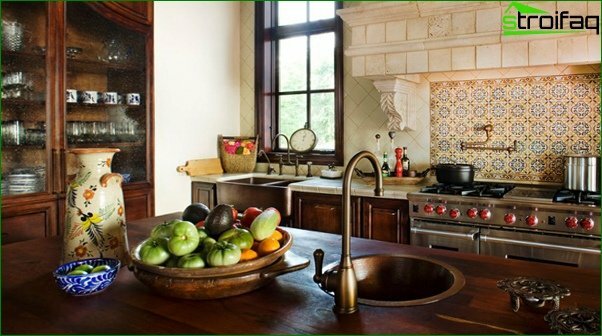 Bright kitchen apron can be self-colored, and perhaps with bright accents and inlays, drawings, borders and friezes (in the case of the tile). 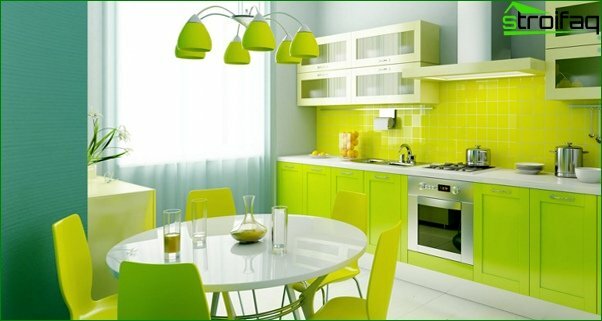 With bright kitchen apron necessarily somethingIt should be combined, otherwise it will stand out from the common kitchen ensemble. The easiest to use for these purposes textiles. 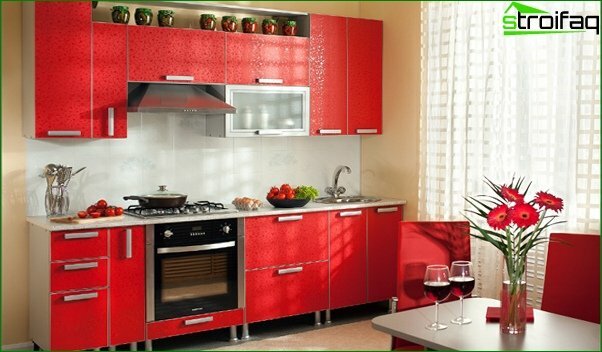 For example, in the tone of apron can be curtains, napkins or kitchen upholstery of the sofa. 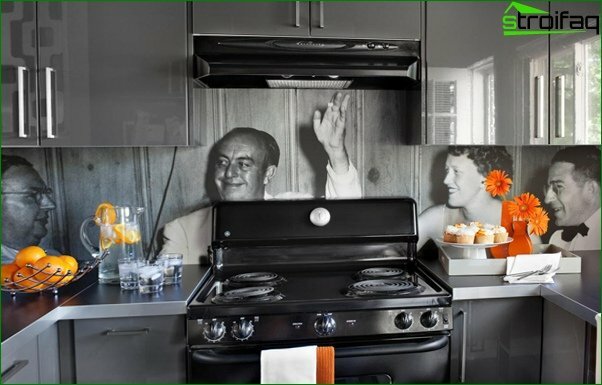 Turn your kitchen into a workart is possible by means of the apron with photo printing. 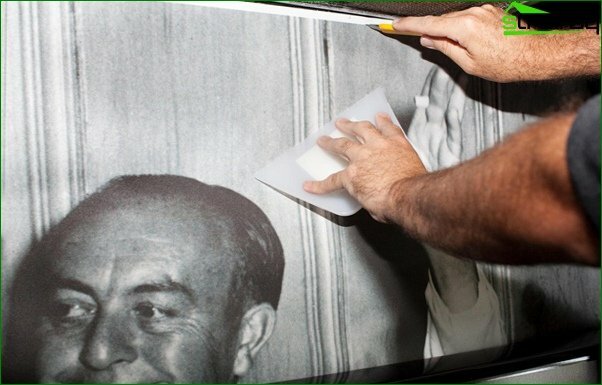 It can be a photo panel of tile, plastic panels with photographs, but most often used for this purpose skinali. 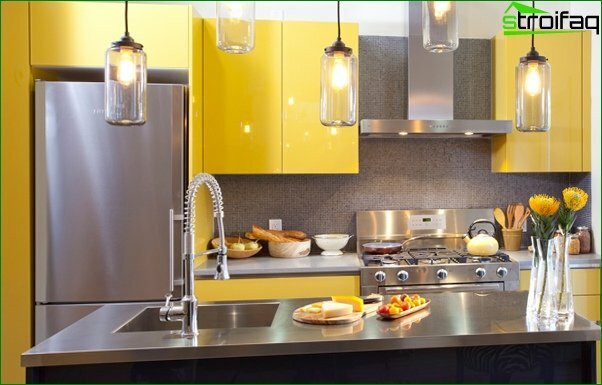 Due to the popularity of this method of decorating the kitchen today you can find a million images on the most different subjects. But if the image in the image gallery you do not like, you can easily provide your own image (only it should be of very good quality). 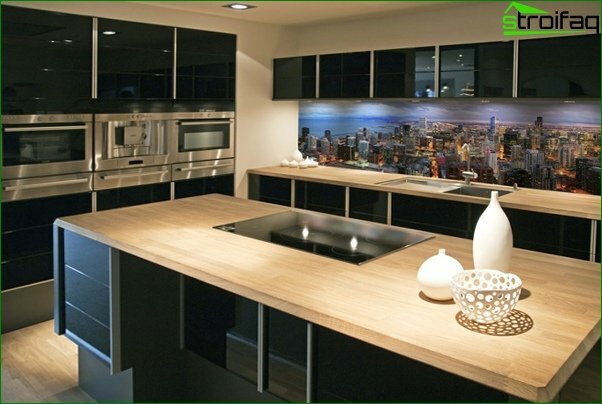 In addition to the apron can also order special decorative panel, worktop or door, which will become an extension of the visual. 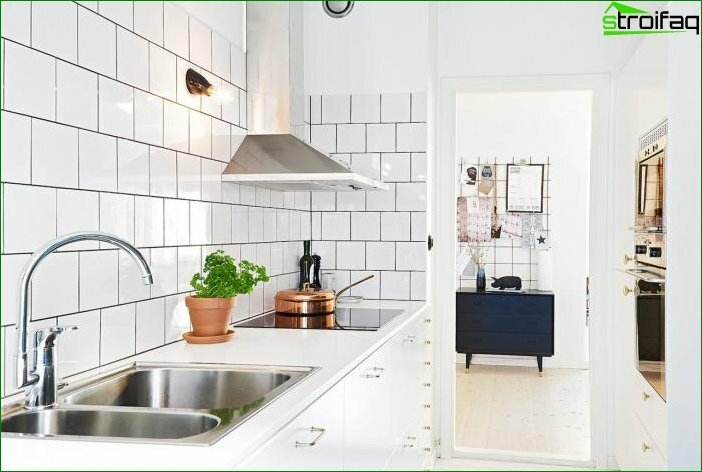 Even in the tiny kitchen you can create beauty and comfort in using the kitchen apron. 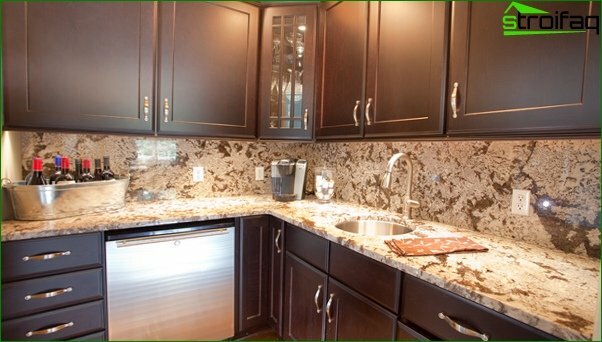 If you decide to do it yourself, it is first necessary to determine the order of what materials will be your apron. 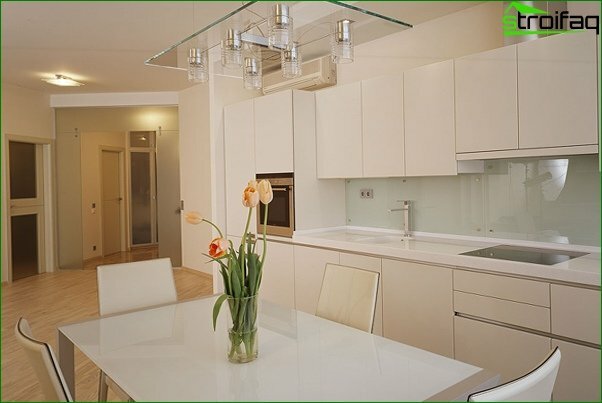 The easiest way to install plastic panels or panels made of laminated MDF / particleboard. However, the life of such panels is not very long. 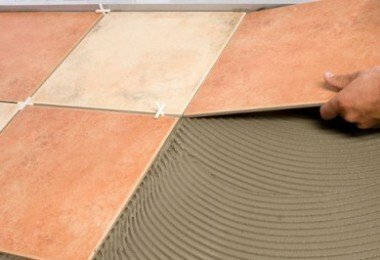 If you are already experienced with the laying of tiles andput, for example, tiles for the bathroom, it is possible to experiment with this material. 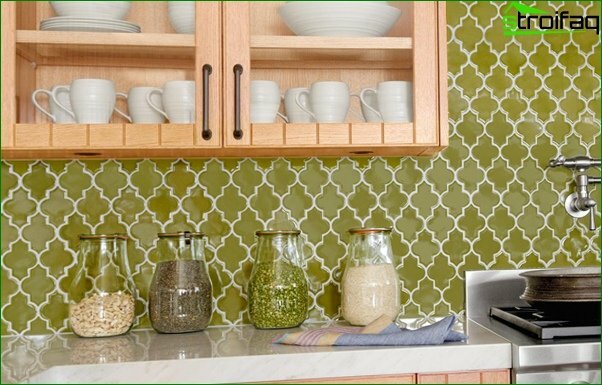 For lovers of vintage and Soviet-era original and stylish solution could be putting some mosaic tiles of the time. However, it is very important to be in this case, choose a high quality moisture repellent grout for joints. 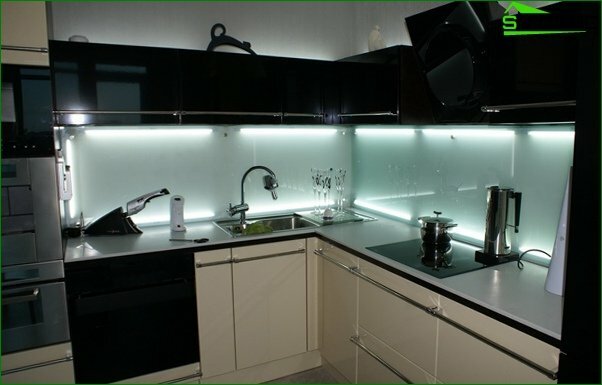 The most beautiful solution for a kitchen apronwill, of course, glass. However, with this material you have to work very carefully, because the slightest bump can turn into chips, scratches, if not completely broken leaf. 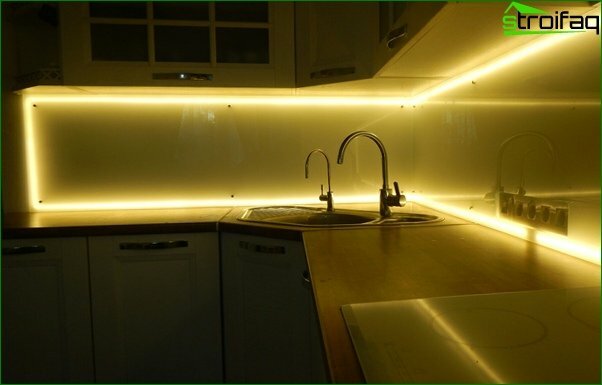 Fittings for glass installation must be of the highest quality. To the glass in the future do not spoil the overload capacity for attachment must be leveled by means of the water level. Even if there is no opportunity to order a glassphoto printing thanks to its transparency behind it can accommodate anything. 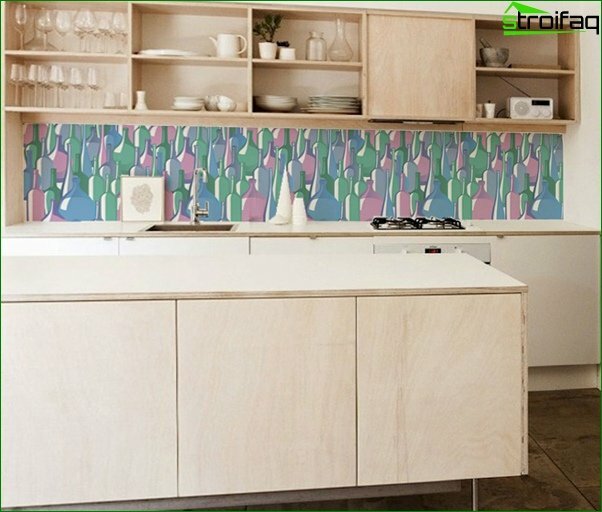 It can be posters of favorite bands, wallpapers, picture collages (only the wall is desirable to pre-paint), and especially creative hostess can embroider kitchen wall panels and set it in a glass. Also, you can paint the glass with special stained glass paints, but it is not very practical, because the paint under the influence of heat can melt.